Head to Head: Do you like HvZ? This game is not unique to Tech and in fact, play on other campuses has resembled warfare. Like that kid that always took gym a little too seriously, so have some players at other schools who don camouflage, cover their face, and shoot projectiles out of toy guns. These practices have caused a reasonable amount of concern in light of campus shootings at UC-Santa Barbara and Virginia Tech. In fact, one game at Bridgewater State University was cut short when police investigated a student after causing legitimate fear among the student body for his resemblance to the Columbine shooters. At Tech however, the game has been moderated to the point that players are banned from dressing in that manner. Launchers have to be approved by administrators, so Nerf Blasters and various knockoffs are banned completely. No student on campus has to fear a bullet-like object since only marshmallows, socks, and foam objects are thrown. Come on, I’d argue that even intramural flag football games are more violent. But while flag football games are restricted to a field, this game is played throughout an entire campus. HvZ cannot be played inside classrooms, at athletic activities, near Greek and religious buildings, or even at athletic fields and in the hours between 11 P.M. and 7 A.M.
As a nonparticipant that spends half her day attending class and the other half studying indoors for hours at a time, I don’t even spend a lot of time in the game territory to form even a slight dislike for the game to begin with! Sure, you can get your exercise in pursuing someone with a yellow headband, but I have two exams the following week to freak out about. While I’m debating whether to switch my major or escape to Lithuania (or as some people call it, walking out of a test), I admit that my temper runs low; the last thing I want is to get held up at the door by a fellow Tech student blocking the door because he is “afraid” of another Tech student simply because this week he is a “zombie.” After all, don’t I have more pressing problems? But no, let these kids play tag for one week out of a long semester. Complaining about this game is like complaining about the noise on game day. 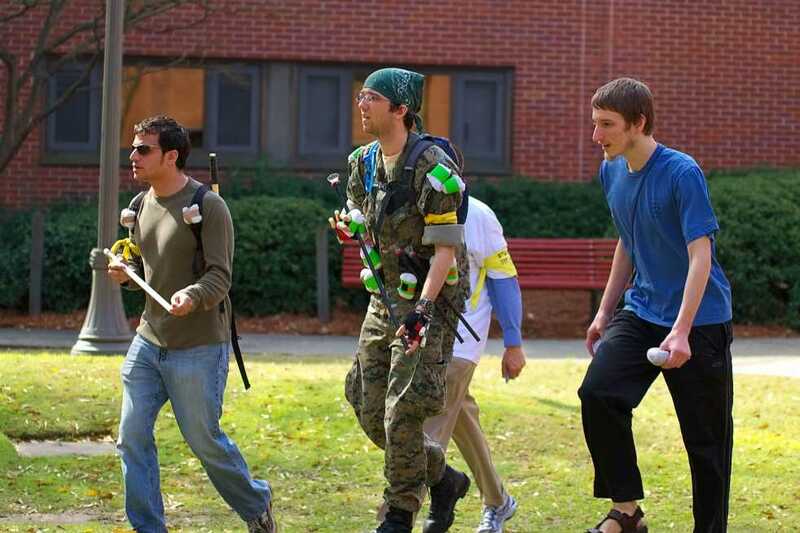 Tech’s HvZ is at worst a temporary annoyance and at best a diversion from a hard semester. I’ll never forget seeing the game in action for the first time. I was a junior in high school, driving down to Tech with my mom to drop some things off with my brother. While I was driving, my mother called my brother to let him know that we were close, when suddenly, a yellow-bandanna man came running out of nowhere, paying no attention to the metal deathtrap that was my car he hurled himself in-front of. I braked. My mom yelled very loudly. And the kid took off without hesitation after a defenseless human. Ever since then, Humans v. Zombies has left a sour taste in my mouth. I don’t want to be a negative-nancy, but when it comes to HvZ, there has always been something that holds me back from jumping on board. Part of it is actually being able to get in the mindset of not caring what other people think of my bright-yellow bandanna being worn around all week. Another part comes from walking out of the Howey and being bombarded by a swarm of zombies trying to get the few remaining humans, even if it means pushing through and crowding areas. The other part is that somehow, each week the game seems to appear on campus in the week I am booked solid with tests, and this year is no exception. When I am swamped with schoolwork and studying, the last thing I want to do is partake in a game. I would hope this game could come at a lull so that more people could participate, but everyone has their own schedules, and that’s not so much my issue with HvZ. And don’t get me wrong, there is something utterly wonderful in seeing a cluster of students having fun with a game and not caring how silly they may look. In fact, if that were all the game was about, then I would be the biggest proponent of the game. I have a problem because many Tech students live up to the stereotype that we may be very book smart, but common sense wise, things just lag, which can make this game go from fun to dangerous very quickly. Common sense says that when there is a moving vehicle, the last thing you should do is run out in the middle of the street. Common sense says that when it rains, the surfaces of walkways can, (wait for it), become very slippery and that maybe running on the walkways at full speed with bundles of socks and marshmallows to catch a may end tragically. Common courtesy says that being mindful of other people should lead a person to still be polite to people not playing the game. I guess what I’m saying is HvZ is not all bad. It appears to be a fun game, it only happens for a week in the semester, and it is something out of the ordinary; however, given the type of students on Tech’s campus, students often neglect things that should not be neglected.